First Friday Artwalks are held on the first Friday of every month at galleries and businesses in downtown Lincoln. While the opening and closing times vary depending on the curator, typically the first receptions begin at 5:00 pm, with the last ones winding down by 10:00 pm. 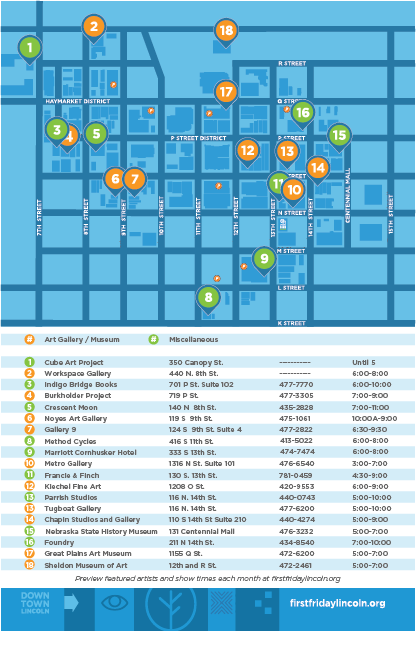 The largest network of art galleries is located in downtown Lincoln from 7th to 17th Streets East to West and the UNL Campus to the State Capitol North to South. To request a physical copy of the map, call us at 402-434-6900. Get a rundown of the current month's showings here.